I think it's time I give up the teaching racket and become a Restroom Redesign Engineer. I am a self proclaimed expert in the field, but I know plenty of people who will back me up and guarantee that I know what I'm talking about when it comes to toilets. I've squatted, I've sat, I've used potties no one else deemed worthy, but when you gotta go, you gotta go. Just don't touch anything and you'll be fine! This revelation about my new title came about because of an unfortunate bathroom experience I had numerous times yesterday. I was doing an expo, a women's technology expo no less, and the nearest bathroom only had this option. I didn't have to keep my foot like this, but I thought I'd use it to illustrate the mishap that had clearly happened when they put in the partitions. 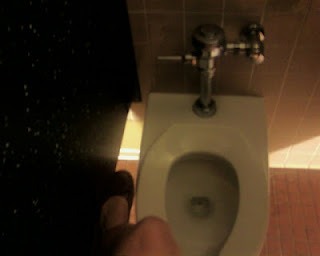 There is literally a space the width of my foot between the wall and the toilet. But on the other side, there is about 2 feet of space. And you know exactly what happened when they installed it. Someone said "Hey Joe, this doesn't quite fit right, does it?" And Joe said "Who cares, it's close enough." But what Joe didn't realize is that whether we sit (the horrors!) 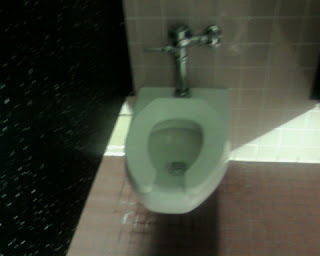 or squat over this toilet, there is no way not to bang your elbow and God knows what else on that wall. I'm a pretty small person, but I imagine a larger woman would have some serious issues actually fitting over that toilet if used the conventional way. Using a public bathroom is an annoyance for most, but using one that isn't comfortable is just wrong. She could, of course, always use it sideways, with her back to that wall, absolutely not the way it was intended, but at least she'd fit. And those of us waiting outside the stall would be left to marvel at the position of her feet under the partition until it was our turn to use it and we realized her brilliance. So again, I clearly could have been of help to these boys as they installed the partitions and demonstrated exactly why close enough won't cut it this time. I have to imagine that they laughed their asses off as they installed that toilet! What a funny and informative blog.....thanks for the laugh......Thank you for sharing with the Clever Chicks Blog Hop this week; I hope you’ll join us again!